Stupid question. I'm on 4.81 now. Is it better to update to 4.82 or stay on 4.81? You guys rock!! I'm excited to see what all comes from this. I have a feeling we're going to see some really cool mods. I cannot understand most of the terms like what is what, becuse I never had a chance to install cfw. 1, can I copy my game from an original disc? How? 2, Can I play with an original disc of ps2 game? So if anybody have patience and time for me, please help me. Or maybe somebody experienced, not the devs (of course they don't have time for that) could make a guide for the beginners. Beacuse I'm sure more and more ppl will ask the same things. many many thanks, sorry for make it long! stay on 4.81 if you can activate your PSN. no point in updating unless you want to. will someone make a video tutorial to build and push packages. really getting lost. Will there be a way to get act.dat on a banned console? Same here. please help out someone? Just wanted to make sure, there is no way to install PS3 games that do not have a rap file right? Also thank you so much PS3Xploit team for this! 1. Dumping Disc version of PS3 game is really hard... you need a bd drive that can dump your disc as in iso and inject the rest of encrypted PIC zone data and such then the dump can be decrypted with 3K3Y's IRD file. if you had a CFW PS3 then you can dump your own game with homebrews like multiMAN and IRISMAN. and that's not over, you will still need to pack this data with game update that's install-able as in PKG format. 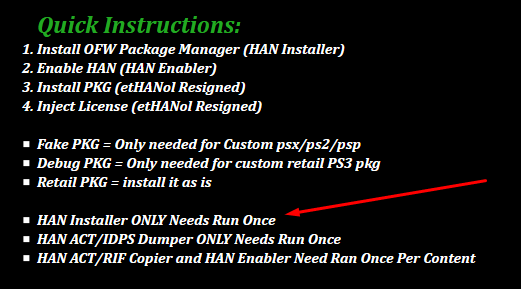 The easiest method I can think of is dumping your PSN contents that you purchased on PSN Store, which is quite pointless when you can just run it without any modification. 3. it's already explained in answer 1, but if you were asking how to make this work without dumping your own, then the question can not be answered here since this is against our site rule. habib, wboy42 and esc0rtd3w like this. Won't someone make a step-by-step video tutorial for beginners on how to use this hack with the PS3 Slim? So it wont be able to play dbrip games from external hardrive? the videos will start showing up...the guide on website and on this thread, as well as all the comments so far have more than clearly explained the process i would think. cikeZ00, ShaolinAssassin, pink1 and 1 other person like this. TheHSN, amaandeep.nz, SurvivalInstinct and 1 other person like this.